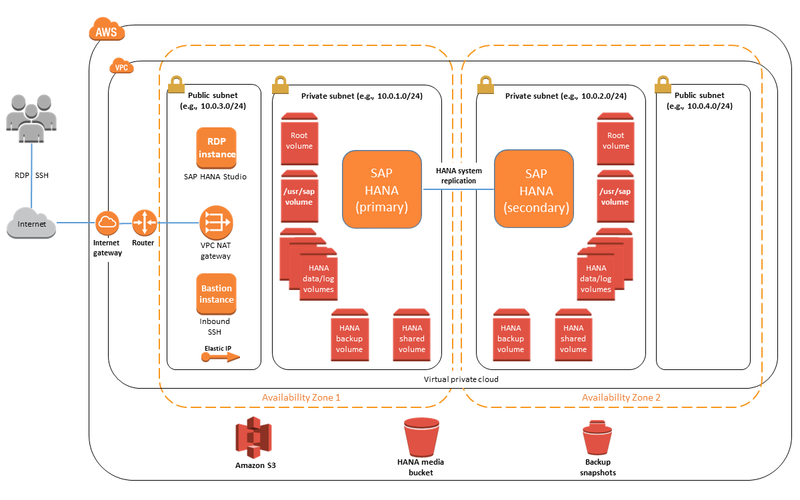 This Quick Start helps you deploy fully functional SAP HANA systems on the AWS Cloud, following best practices from AWS and SAP. SAP HANA is an in-memory relational database and application platform that provides high-performance analytics and real-time data processing. AWS provides SAP customers and partners with an SAP-certified cloud infrastructure to run SAP HANA. The Quick Start ensures that Amazon Elastic Compute Cloud (Amazon EC2), Amazon Elastic Block Store (Amazon EBS), and the operating system are optimally configured to achieve the best performance for your SAP HANA system right out of the box. This Quick Start supports the R3, R4, R5, and X1 instance families as well as Amazon EC2 High Memory instances that have 6 TB, 9 TB, and 12 TB of memory, to boost the performance of large-scale, memory-intensive SAP HANA workloads on AWS. The Quick Start supports both Single-AZ (single-node or multi-node) and Multi-AZ (single-node), high availability configurations. EC2 instance(s) to host the SAP HANA database, with the appropriate EBS volumes configured to meet or exceed key performance indicators (KPIs) for SAP HANA storage. The Single-AZ configuration gives you a choice of Linux operating system (SLES, SLES for SAP, SLES for SAP BYOS, RHEL for SAP HANA, or RHEL for SAP with High Availability and Update Services). The Multi-AZ configuration supports SLES for SAP and SLES for SAP BYOS. AWS Identity and Access Management (IAM) instance roles with fine-grained permissions for access to the AWS services. An optional, automated installation of SAP HANA software. In a public subnet, an optional EC2 instance with Windows Server to host SAP HANA Studio. You can install SAP HANA Studio manually to administer your SAP HANA database. An optional configuration of AWS CloudTrail trails and AWS Config to help with compliance, audit, and change management requirements. Your choice of Single-AZ (single-node or multi-node), or Multi-AZ, high availability (single-node) configuration. If you don't already have an AWS account, sign up at https://aws.amazon.com and prepare your account. Subscribe to the operating system image in AWS Marketplace. Download the SAP HANA software to an S3 bucket. 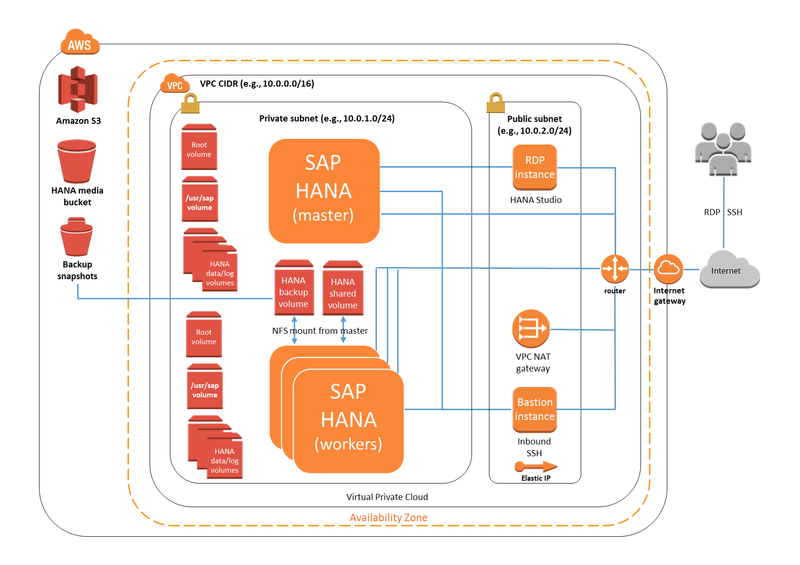 Access SAP HANA nodes on AWS. Perform testing, backup, and other post-deployment tasks. To customize your deployment, you can choose the operating system, choose an instance type for the SAP HANA host, select the number of nodes in a Single-AZ SAP HANA cluster, configure high availability settings for a Multi-AZ setup, and specify additional options. The AWS CloudFormation template for this Quick Start includes configuration parameters that you can customize. Some of these settings, such as instance type, will affect the cost of deployment. See the deployment guide for additional details and estimates. This deployment uses a Bring Your Own License (BYOL) model for SAP HANA. You must already own a license for SAP HANA, and you must have access to the SAP Software Download Center to download the software. The Single-AZ deployment option launches the Amazon Machine Image (AMI) for the operating system you choose—SLES, SLES for SAP, SLES for SAP BYOS, RHEL for SAP HANA, or RHEL for SAP with High Availability (HA) and Update Services (US)—and the license cost for the operating system is included in the Amazon EC2 hourly price. There is an additional software cost for SLES for SAP AMI subscriptions in AWS Marketplace. For SLES for SAP BYOS AMIs, you can use your existing, valid subscriptions. The Multi-AZ (HA) deployment option is based on the SLES High Availability Extension (HAE), which is included in SLES for SAP; therefore, SLES for SAP is the only operating-system option for Multi-AZ deployment. You must have subscribed to the AWS Marketplace offering for SLES for SAP, or have a registration code (if you choose SLES for SAP BYOS) before you start deployment.